Is is correct, that you have to enter the allowable soil pressure as the characteristic value in input form 1.1 General Data in FOUNDATION Pro? Is the design value determined automatically? The characteristic value of soil pressure is entered in input form 1.1 General Data. See Figure 01. 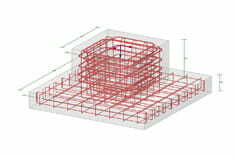 The estimated partial factor for spread foundations can be found in the parameters of the national annex you selected for the design. See Figure 02.